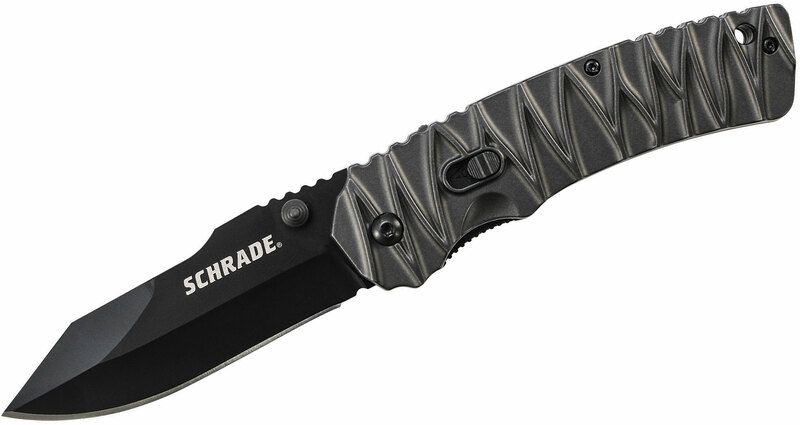 The Schrade SCHA10 Series of assisted opening knives feature durable milled aluminum handles with a shape that really locks it into your hand well. The blade is a highly functional drop point shape, much like a reverse tanto, made from black coated AUS-8 high carbon stainless steel and you have your choice of partially serrated or not. These attractive designs feature fast operation and a very solid feeling in the hand. 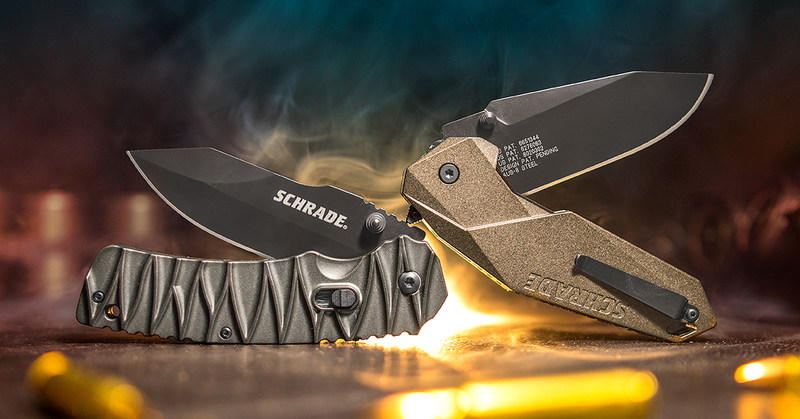 They are great EDC options with non-reversible pocket clips set up for tip up carry and a safety mechanism. 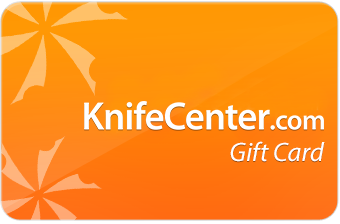 Knifecenter.com carries the full line of both Schrade and Smith & Wesson knives and they are some very cool and functional tools always at a great price! 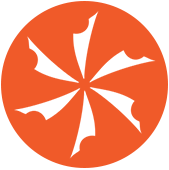 Outdoor enthusiasts, hunters and, most recently, law enforcement and fire safety professionals utilize Taylor Brands products. The Auto and Manual mode is cool and works perfectly , but thats not why I bought this knife . This knife grips in my hand fantastic ! It locks up well and is pretty much a tank . 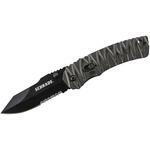 The steel is decent , sharpens fairly easy and holds an edge reasonably well . The weight of it doesn't bother me , I dig it , but it would be something to consider if youre used to something lighter . The gimping on the top of the blade , along with the texture of the handle , is like continual gimping but done real well .. comfortable and real grippy . Aluminum has never been my thing but this one just works and feel right . I enjoy this knife . 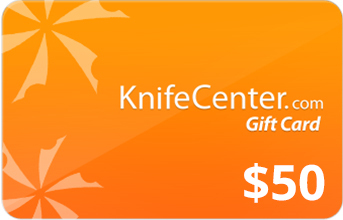 This knife is well constructed. It has this such great feature that you get to select the assist or manual deployment for the blade opening. By selecting the manual mode, I feel comfortably to put it in my pocket without having to worry the blade popped open accidentally in my pocket. And when I need a quick access for the blade , it is always ready to work. The knife works really well in assisted mode as well; Furiously FAST like magic! 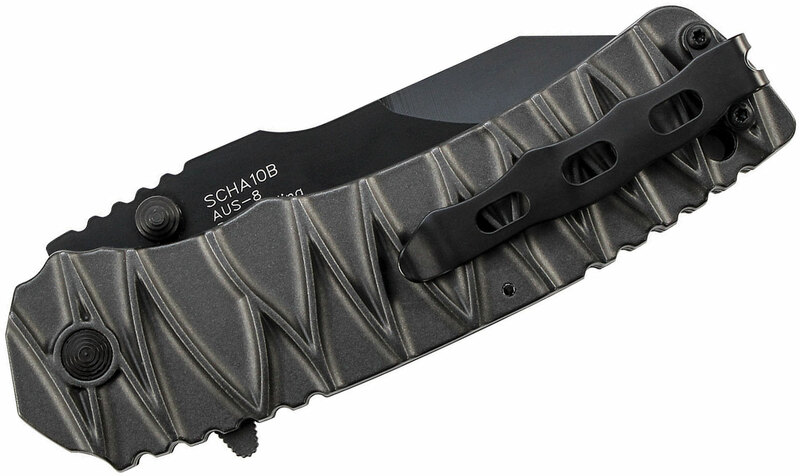 Hey, I wanted to share "Schrade SCHA10B MAGIC Dual Action Assisted Flipper Knife 3.47 inch Black Drop Point Plain Blade, Milled Aluminum Handles" with you from KnifeCenter.